When you think of Placenta Encapsulation and how to preserve your placenta you automatically think of Placenta Pills. However there is another amazing way of preserving your placenta, and this involves soaking in high-proof vodka for 8 weeks, resulting in a beautiful clear coral/orange/pink liquid which has a surprisingly organic, sweet, earthy and addictive aroma. We call this remedy Placenta Tincture. To administer Placenta Tinctures you can either add some drops to a half cup of water, juice or a herbal tea (which will burn off the alcohol) as and when needed, or if you like drop directly under your tongue for it to enter your blood stream quicker. Your Tincture need time to mature which make this remedy super potent and different from your Pills, but equally as beneficial. You Tincture will be ready just as you will be running low, or out, of your Pills. Your highly concentrated Tincture does not go through any dehydrating or cooking process, which is how your Placenta Capsules are made. Your Tincture is made with fresh placenta, which is preserved and retains the stem cells, growth factors and hormones which help your post-birth healing after all your Capsules have been used. Your Tincture can also be made from your Capsules, however it is best made from fresh placenta as the stem cells and growth factors will be more potent than the placenta powder in the Capsules. Tincture is overlooked when considering which Placenta Remedies and Lotions to choose from. When you look at how the Tincture can supplement you, it soon becomes a popular Remedy for clients choose from. Very often clients order two 300ml bottles. The Tincture works similarly to your Placenta Capsules, the bonus being it lasts for years, unlike Capsules which need to be used within a certain time frame, which is 6 months for the Traditional Chinese Medicine Capsules and 12 weeks for Simple Placenta Capsules. The great thing about Placenta Tincture is that if you find that you still need an added boost down the road after your Pills are gone, your Tincture can support you and give you the physical and emotional balance you need. If you are breastfeeding for longer than a few months your Tincture will boost your milk supply helping with those times your baby is having a growth spurt. Your Tincture will also give you the reassurance some new mummies need, especially after all the causes have been used. 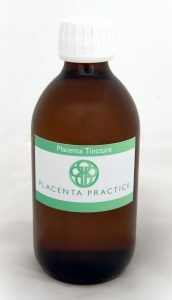 Placenta Tincture is your long-term option for placenta consumption. 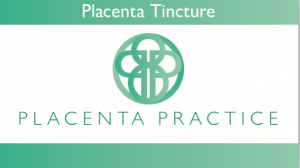 Your Tincture will extend the benefits of your placenta once all your capsules have gone. The Tincture maintains its potency for years, meaning you don’t have to worry about using it all like your Placenta Capsules, you can save it and use as and when needed in the months and years to come. Only a tiny portion of placenta is needed to make 300ml of Placenta Tincture and due to its long shelf life, it will support you into your menopausal years, something which us females mustn’t overlook. Your Tincture is your bio-identical hormone source, and for this reason alone I would advise every client to invest in Placenta Tincture . This long lasting remedy is a must have, and many of my clients have bought 2, 300ml bottles, one to use during their periods to balance hormones and times off illness and one to save for the menopause. The Tincture will be your hormone replacement during menopause, and will be far more effective than another synthetic oestrogen and progestogen replacement. Instead of taking tablets, skin patches, gels and vaginal creams, pessaries or rings you can take you very own hormone balancing remedy Placenta Tincture. Many of my clients who suffer from premenstrual tension, hormone fluctuations and heavy bleeding during their cycles reported they found it lessened their symptoms and made them much calmer, able to cope, decreased monthly blood loss and generally relieving the discomforts of menstrual cycles. Tincture is an immune boosting remedy too, so if you are feeling run down this remedy is sure to pick you up. I highly recommend Placenta Tincture to all my clients. It’s a great fallback to your capsules since we never really know how many Placenta Pills you will get from your placenta. The smallest amount of Pills I made was 60, and that client was extremely happy for having a placenta package which included a Tincture and a Placenta Essence. In next month’s Blog I will be writing about Placenta Essence, which is very similar to Placenta Tincture expect that it is a remedy specifically for baby. This entry was posted in Placentas. Bookmark the permalink. Which Placenta Capsules are better? How do I store my placenta once it has been birthed? Do Placenta Smoothies help with weight loss? Why should I Encapsulate my Placenta?